“Prius,” in Latin, means roughly “to go before.” Since its first appearance in 1997, Toyota’s iconic hybrid has lived up to its name, with more than 1.5 million sold world wide. Revamped in 2003 with Toyota’s hybrid synergy drive, the Prius is now entering its third generation with the 2010 model to be available later this year. 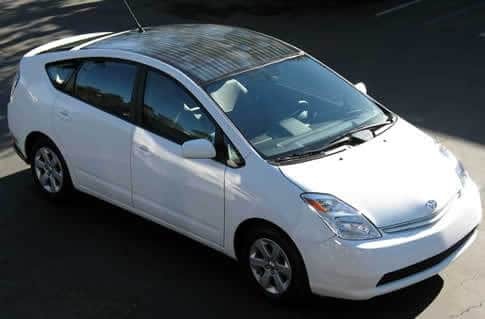 And, in keeping with its tradition of “going before,” this Prius will be equipped with solar panels on the roof, a significant first for the automotive industry. Alas, these panels will not be used to charge up the Prius’ batteries, but instead will channel power to the air conditioning and reduce the energy draw on other electrical systems. Some critics are calling the inclusion of the panels nothing but a green stunt, but even nay-sayers have to admit that getting functioning solar panels on the market in what is arguably the only “mainstream” hybrid on the road is a significant achievement and a step in the right direction. In official releases coming from Toyota we learn that, “Internal tests show that Prius’ zero-to-sixty acceleration time has dropped from the previous generation’s mid 10-second range to 9.8 seconds, making it comparable to that of an average mid-size sedan with a 2.4-liter engine.” Also look for a “power” driving mode that ups throttle sensitivity to make the car more responsive and an “ECO” mode that increases fuel efficiency. In North America, the 2010 will also come with an EV-Drive mode that allows the driver to put the car in all-electric operation at slow speeds over a distance of up to a mile, which also may help to lower Prius insurance rates. Fully loaded, you’re looking at about $30,000 for the 2010 Prius. (A full plug-in model is expected to appear in 2010 as well.) While the solar panels don’t fulfill a futuristic dream of clean, free fuel from the sun, they do represent Toyota’s commitment to “go before,” and are undoubtedly the harbinger of more solar uses in models to come. It was not the first, AUDI first did this in 2005 2006 with their special “Race” series. AUDI first put solar panels on the roofs of their cars. I know, my buddy has one. WOW!!! 0-60 in 9.8 seconds… that’s amazing! -ly bad. The Bugatti Veyron does 0 -100 then back down to 0 in 9.9 seconds. But still, lets put this in perspective. The old Honda insight got and EPA estimated 70. Why do people love priuses again? They’re not the most efficient and they’re not fast. I’m going to assume that roof panel is roughly 2’x4′. Even with monocrystaline cells, that’s about 300 watts/h. Max. Of course, this would cost +$500, plus it has to be made round. So +$1000 production cost, so +$2500 to you. Probably cheaper cells then. And because its separate from the batteries, its only useful if you’re using the air conditioning on a sunny day. IE not useful in spring, fall, winter.